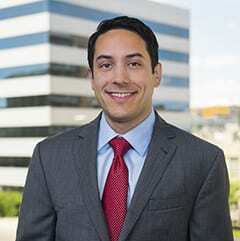 Jeffrey Houle is an associate in Carmody Torrance Sandak and Hennessey’s Business Services and Real Estate practice groups. Jeffrey’s practice focuses primarily on assisting businesses in all aspects of their operations including entity formation, mergers and acquisitions, corporate governance, commercial financing and commercial real estate transactions. Jeffrey also represents developers and condominium associations in the development of projects including the purchase, lease, financing and construction of commercial and residential developments. Jeffrey also enjoys representing individuals in the purchase and sale of residential real estate.